A proper strength and conditioning regimen is an essential part of developing healthy, resilient high-performing athletes. 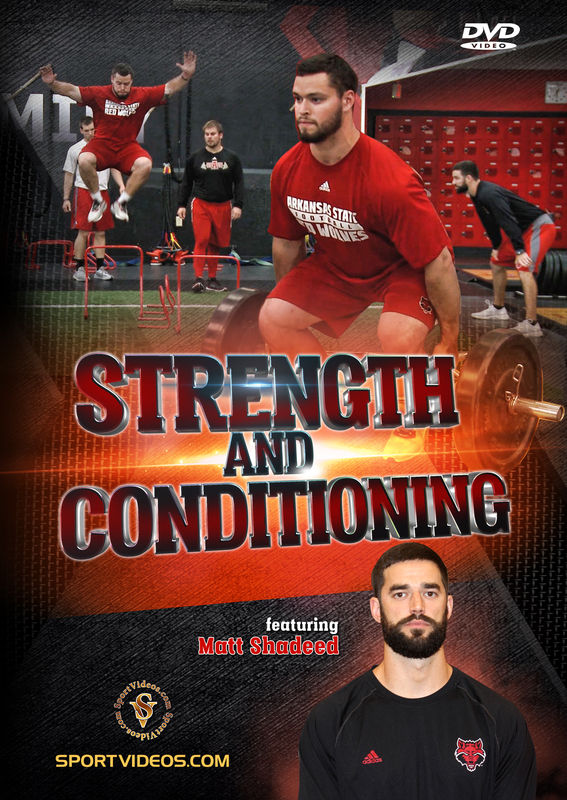 In this video, Matt Shadeed demonstrates the ins and outs of the Arkansas State football strength and conditioning program. Among the topics covered are: Weight Room Warm Up, Stationary Dynamic Warm Up, Dynamic Warm Up, Dynamic Linear Improvement Drills, Multidirectional Movement Skills, Plyometric Progressions, Power Clean Progression, Squatting Variations, The Split Jerk Exercise, The Trap Bar Deadlift, Upper Body Auxiliary Exercises and the Pillar Protection Program This DVD is an invaluable resource for coaches and athletes looking to elevate their training program to a new level! 114 minutes. 2017. About the Coach: Matt Shadeed spent three years at Arkansas State University in Jonesboro, Arkansas, leading the football strength and conditioning. The Red Wolves' football program won back-to-back conference championships (2015, 2016) under his direction. Prior to Arkansas State, Shadeed spend two years as the assistant strength and conditioning coach for football at the University of Mississippi and nine months as the assistant strength and conditioning coach for women's basketball and softball at the University of Southern Mississippi. Matt Shadeed recently accepted a position as Director of Athletic Performance for the Baylor University women's basketball program in Waco, Texas.